Perhaps it’s just the fall season, or maybe we’re having some serious nostalgia for the days of Gossip Girl, but we can’t seem to get prep-school prints off our minds these days. As it appears, neither can any other fashion lover, either. No matter where we look, we’re seeing plaid outfits for fall everywhere, and it looks like this is just the beginning of the outfit trend sweeping the sartorial scene. Whether it’s in the form of a vibrant color reminiscent of Clueless or as a more versatile, neutral hue, the plaid print will give your outfits an extra hint of edge like none other. 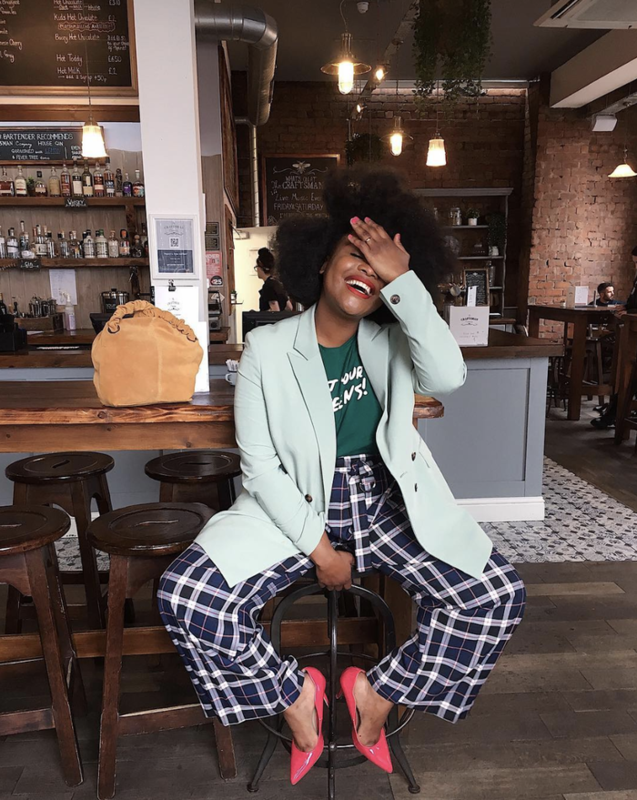 To show you what we mean, we rounded up ensembles from the coolest It girls who know how to channel that cool-girl plaid vibe in all the right ways. From coordinating tartan prints to matching sets, we’ve never seen the preppy staple look so good. Take a page from their books, and you’ll incorporate the pattern into your fall wardrobe seamlessly. Complement a pair of blue plaid pants with cool-toned pieces like mint green. Add an extra pop of color with neon heels. A mint blazer is so unexpected. Styling a graphic tee with a pair of plaid pants will look so rocker chic. Can't go wrong with a classic graphic T-shirt. You can wear a plaid midi skirt with a classic piece like a blazer. Style bold tartan pants with a neutral blazer for an edgy look with some polish. Make this your next going-out top. If you're feeling bold, get these. A plaid dress will look so stylish for fall. Let that be the focus of your outfit and accessorize with a PVC purse. Style this with sneakers for the day. You'll look so chic carrying this. Bring back the '80s with a matching set, and throw on chunky sneakers to play into the trend. Talk about a conversation starter for shoes. When wearing a vibrant pair of plaid pants, coordinate with your top, such as sheer pink blouse. Brighten up your ensemble with this blouse. Statement pants if we ever saw them. Dress up a plaid midi skirt with a flirty off-the-shoulder top for a dressed-up approach for the fall. Wear this on a night out. Wear this with a pair of boots for the fall. We can't shy away from a monochrome outfit. Coordinate your skirt with your blouse and even your sunglasses. A bright top will always be a good option for the fall. You'll never get tired of this color. Can't get enough plaid? With two different versions of plaid, add on a pair of white ankle boots to pull your ensemble together. The sleeves on this are everything. So good, and under $30? Even better. You can never go wrong with a neutral plaid blazer and an everyday pair of jeans. A classic plaid blazer will be a perfect alternative to your standard black one. You can never go wrong styling your plaid pants with a simple long-sleeve T-shirt and brogues. Throw a chic plaid blazer over a colorful dress to give your ensemble some extra oomph. Turn some heads in this. If you're sporting an all-black outfit, let a colorful plaid cardigan and a pair of white boots provide a pop of color. Cozy up in this for fall. If you're wearing a plaid dress, accessorize with standout accessorize like a beaded purse. You can style this for any season. You'll get so many compliments with this purse. Now, see another chic way to wear plaid this fall.